Learn by doing in the MMBPro online course. Experts Dr. Zindel Segal and Dr. Sona Dimidjian bring you MMBPro, an 8-week online program that delivers the core content and practices of mindfulness meditation and cognitive therapy. This online course provides you with tools for preventing relapse in depression and enhancing emotional wellness in your clients over time. 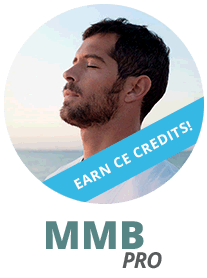 Enhance your clinical skills by learning the core content and practices of MBCT. Learn elements of MBCT as you participate in the 8-week online program. Reflect on each session on how to translate your learning into your work with clients. Get your questions about your personal practice answered by experts. Connect with a community of learners practicing alongside you. Prevent depression and stay well over time. MMBPro provides an option for therapists who do not have ready access to an in-person Mindfulness-Based Cognitive Therapy group, as a training resource. MMBPro is an 8-week online program that delivers the core elements of MBCT. Comprehensive data on Mindfulness-Based Cognitive Therapy's effectiveness come from two major sources. The first was a study that reviewed the outcomes of nearly 600 patients and found that the risk of depressive relapse was significantly reduced in patients receiving Mindfulness-Based Cognitive Therapy, compared to those who had not received the treatment. The second was a study that reviewed the outcomes of 1100 patients and found a reduction in anxiety and depressive symptoms in those patients receiving mindfulness-based interventions. Furthermore, and perhaps the most compelling endorsement for Mindfulness-Based Cognitive Therapy comes from the United Kingdom's National Institute of Clinical Excellence, known as NICE. This is an independent body that provides clinical guidelines for evidence-based care to patients using the healthcare system in the UK. The NICE guidelines for unipolar depression have, since 2004, consistently endorsed Mindfulness-Based Cognitive Therapy as an effective means for the prevention of relapse and recurrence in depression. This has provided patients with an additional resource at their disposal for comprehensive depression care. Piet J, Hougaard E. The effect of mindfulness-based cognitive therapy for prevention of relapse in recurrent major depressive disorder: A systematic review and meta-analysis. Clinical Psychology Review 2011; 31:1032-1040. Hofmann SG, Sawyer AT, Witt AA, Oh D. The effect of mindfulness-based therapy on anxiety and depression: A meta-analytic review. Journal of Consulting and Clinical Psychology 2010; 78:169-183. National Institute for Health and Clinical Excellence, 2009. Depression: The treatment and management of depression in adults. NICE Guidance, Report No. : CG90, UK. COUNSELORS & MFTs: IBH is approved by the Illinois Department of Professional Regulation (License # 168-000119). IBH has been approved by the State of Texas Marriage and Family Therapist Examiners to provide continuing education activities. Provider # 154. Institute for the Advancement of Human Behavior, Inc. (IAHB) is recognized by the New York State Education Department's State Board for Mental Health Practitioners as an approved provider of continuing education for licensed mental health counselors. #MHC-0063. Counselors may earn 12 contact hours. This activity consists of 12 clock hours of continuing education instruction. Credit requirements and approvals vary per state board regulations. Many state boards accept offerings accredited by national or other state organizations listed here. If your state is not listed, please check with your professional licensing board to determine whether the accreditations listed are accepted. NURSES: The for Better Health accredited as a provider of continuing nursing education by the American Nurses Credentialing Center's Commission on Accreditation. Provider approved by the California Board of Registered Nursing, BRN (Provider CEP#2672), for 12.00 contact hours. PHYSICIANS: This activity has been planned and implemented in accordance with the Essential Areas and policies of the Accreditation Council for Continuing Medical Education (ACCME) through a sponsorship of IBH. IBH is accredited by the ACCME to provide continuing medical education for physicians. IBH designates this enduring material for a maximum of 12.00 AMA PRA Category 1 Credits ™. Physicians should only claim credit commensurate with the extent of their participation in the activity. SOCIAL WORKERS: IBH SW CPE is recognized by the New York State Education Department’s State Board for Social Work as an approved provider of continuing education for licensed social workers #0091. This course is approved for 12.00 contact hours. As an approved continuing education provider for the Texas State Board of Social Worker Examiners, IBH offers continuing education for Texas licensed social workers in compliance with the rules of the board. License No. 3876; Mail Code 1982, PO Box 149347, Austin, TX 78714, (512) 719-3521. Institute for Better Health (IBH), #1426, is approved as a provider for social work continuing education by the Association of Social Work Boards (ASWB) www.aswb.org, through the Approved Continuing Education (ACE) program. Institute for the Advancement of Human Behavior maintains responsibility for the program. ASWB Approval Period: 3/16/2017 – 3/16/2020. Social workers should contact their regulatory board to determine course approval for continuing education credits. Social workers participating in this course will receive 12.00 clinical continuing education clock hours. Web-based Mindfulness-based Cognitive Therapy for reducing residual depressive symptoms: An open trial and quasi-experimental comparison to propensity score matched controls. Dimidjian S, Beck A, Felder JN, Boggs JM, Gallop R, Segal ZV. Behav Res Ther. 2014 Dec;63:83-9. Web-based intervention in mindfulness meditation for reducing residual depressive symptoms and relapse prophylaxis: a qualitative study. Boggs JM, Beck A, Felder JN, Dimidjian S, Metcalf CA, Segal ZV. JAMA Psychiatry. 2016 Jun 1;73(6):565-74. doi: 10.1001/jamapsychiatry.2016.0076. Kuyken W, Warren FC, Taylor RS, Whalley B, Crane C, Bondolfi G, Hayes R, Huijbers M, Ma H, Schweizer S, Segal Z, Speckens A, Teasdale JD, Van Heeringen K, Williams M, Byford S, Byng R, Dalgleish T.